The greatest adventure movie once again returns to DVD, just weeks before the release of Indiana Jones and the Kingdom of the Crystal Skull. The first movie, Indiana Jones and the Raiders of the Lost Ark revolves around a treasure-hunter archaeologist called Indiana (Henry) Jones played by the charismatic Harrison Ford who attempts to find and return ancient artifacts to museums before nefarious treasure hunters and Nazi occult leaders get their hands on this mystic objects. Traversing the globe, Indiana Jones uncovers the whereabouts of the Ark of the Covenant (from Bible) and unfortunately for our hero, he has his nemesis following his every move in order to claim this mystic power for the Nazis. In the hands of the Nazi's, the Ark of the Covenant could turn the tides of the war and see the Axis win. The Indiana Jones series is reminiscent of those action adventure serials from the early days of Hollywood that contains over the top stories, a larger than life action, stunts and special effects that easily draw you into this amazing and classic adventure movie. 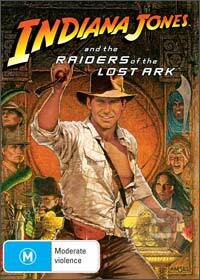 Romance, action, drama and adventure, Indiana Jones and the Raiders of the Lost Ark is a must have a DVD. The video quality of Indiana Jones and the Raiders of the Lost Ark is phenomenal and almost appears that it was filmed yesterday. The video quality as is the audio quality has been digitally re-mastered with an almost modern clarity to the entire DVD. Needless to say, a Plasma or LCD with a surround sound system will truly make this movie an almost cinematic experience. The DVD also contains some extremely entertaining and interesting special features with behind the scenes of the movie which gives you a more unique perspective of the making and the characters themselves.